Work at home phone jobs are really big right now. Tons of companies are saving money by creating virtual call centers fully staffed by remote workers all across the globe. Once you're set up to do phone work — and there are some important requirements that you'll have to arrange in advance if you want to get into it in a serious way, including a land-line and a quiet working space — you'll be able to find a large number of companies that are hiring at almost any given time. Many of these jobs offer decent pay, good hours, and some even have nice benefits packages. Unfortunately, a large percentage of the phone gigs out there require you to become a salesperson, which isn't everybody's cup of tea. Some folks just aren't all that comfortable with the whole process of persuading people. Maybe they're a little shy, or maybe they feel awkward advocating for products that they don't use personally. There are lots of valid reasons why sales work just isn't a good fit for certain individuals. 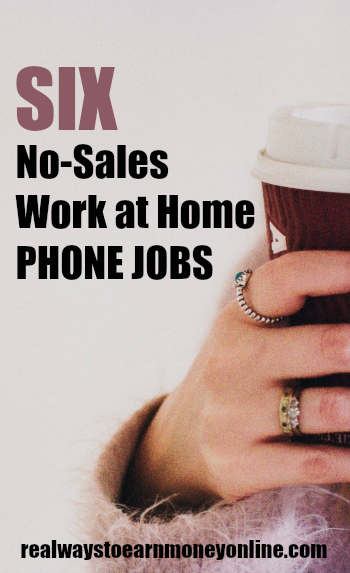 The good news is there are quite a few phone jobs that don't require any selling at all. In this article we'll go over a handful of these to give you a feel for what's out there. Before we begin, there's one thing to keep in mind — these jobs tend to get filled very quickly, so you may need to check fairly often to see if there are any open positions available. All the companies listed here have a large team of home-based phone workers, but they aren't always hiring, so if you don't see any jobs listed right now, just keep checking. As a VoiceLog operator, you will listen to recordings of sales calls to determine if they are valid or there is evidence of sales fraud. Pay is on the low side — around $8 to $9 hourly. You are paid based on the number of calls you review. Payments are made twice monthly. Go here to check for openings at VoiceLog or read our VoiceLog review. This company has a popular phone app that helps travelers find unsold rooms at discounted prices. They hire remote workers for a wide variety of positions, and their “customer escalation representative” job is one in particular that requires no sales skills at all. You'll be helping people who have issues with their rooms and/or technical problems using the app. The jobs are full time, and they provide workers with a pretty nice benefits package. Go here to check for openings at Hotel Tonight or read our Hotel Tonight review. If you have an interest in real estate, this might be the job for you. Yardi Matrix is a company that does data research on property prices and availability. They hire remote phone agents to do surveys about rental properties. You'll have to play the role of a renter when you make your calls and ask questions about each property. The job is seasonal, lasting for six weeks. The pay isn't fantastic, but it might still be a good gig to grab for folks who don't like sales work. Go here to check for openings at Yardi Matrix or read our Yardi Matrix review. This company specializes in modern internet marketing, and they've built a high quality software suite that helps with things like customer tracking and SEO. They occasionally hire remote customer support agents in several different countries. The jobs aren't available all the time, so you may have to wait a while for an opening, but it's a nice job to get with great benefits. People who work for this company generally give them extremely high marks. Also, an important note — this is another company where the job offerings on their careers page aren't always the same as the ones being posted on sites like Indeed, so it might pay to keep an eye on a few different places around the net if you want to nab one of these positions. Go here to check for openings at Hubspot or read our Hubspot review. MaritzCX has regular opening for work at home market research interviewers. This is basically an entry-level position, but you do need to be comfortable using a computer and have a clear speaking voice to qualify. Go here to check for openings at MaritzCS or read our MaritzCX review. This is a medication reminder service to help people starting out on a new drug. You'll be giving people advice, answering questions, and making sure they take their meds at the appropriate time. Most of what you do will involve reading from a script, so it shouldn't be overly difficult, and there are no sales duties at all. Go here to check for openings at Pleio GoodStart or read our Pleio GoodStart review. This is just a small sampling of the phone jobs out there that don't require any selling. There are many other similar jobs available that might be hiring at any given time, and the number is growing every day. For a larger sample of available jobs, check out our master list of categorized work at home phone jobs. Check out this e-book with a list of 150 companies that regularly hire home-based workers and step-by-step instructions on becoming savvy at finding work at home jobs online yourself.